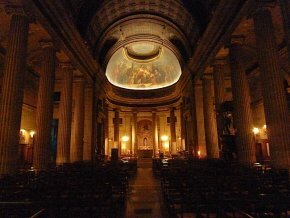 This article inaugurates a new series devoted to Parisian churches. Although we often point out endangered religious sites, those here in the capital have escaped our attention thus far as we tend to assume that they are well protected. Unfortunately, this is not at all the case. The department in charge of preserving and restoring art works and mural paintings (the COARC ) works diligently on important projects, certain restorations of major sections of buildings have also been carried out in the past few years by the Bureau des Edifices Cultuels & Historiques (BECH), but the need is so great and some churches are so deteriorated that it is now time to admit that this is not enough. In an article published last Thursday, 9 December in the TéléObs supplement of the Nouvel Observateur entitled “La misère des églises parisiennes”, Morgane Bertrand gives us the figures provided by Paris City Hall  : during Bertrand Delanoë’s first term, from 2001 to 2008, 80 million euros were spent on maintaining and restoring churches, that is about 11.5 million per year. This budget has been significantly reduced since Bertrand Delanoë’s re-election (25 million euros less). These amounts are much too low. The city’s current financial situation or the lack of action by previous teams are not legitimate arguments. This state of affairs is not new and it is obvious that former mayors did not set a good example either. But Bertrand Delanoë has been running Paris for almost ten years. And we cannot help but compare the state of the churches to the construction of a new stadium, the Jean Bouin, which goes to show the city’s priorities. This enormous structure devoted to sport as entertainment will cost the Parisian taxpayer 200 million euros in little over one year. Compared to the 11.5 million euros spent annually for the churches, we can only conclude that things are not really fair. 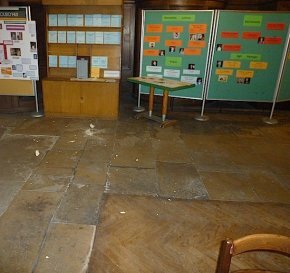 To show our good faith and thus also more positive points, some of the articles in our series will highlight churches which have been restored, or where work is underway. 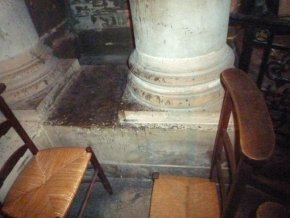 We begin today, however, with a building which is in extremely grave danger, though not visible to visitors who enter : the church of Saint-Philippe-du-Roule (ill. 1 and 2). 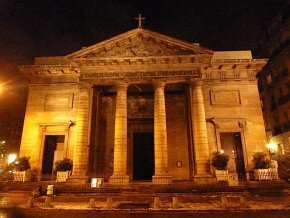 It was built in the late 18th century, designed by Jean-François Chalgrin who submitted his plans in 1764 although construction did not begin until 1774 and the blessing of the church took place only in 1784. Two additions were incorporated in the 19th century, the first by Hippolyte Godde between 1843 and 1847, then another by Victor Baltard in 1853. Godde built the ambulatory and the central chapel (chapel of the Virgin), Baltard was responsible for the catechism chapel to the left of the choir. 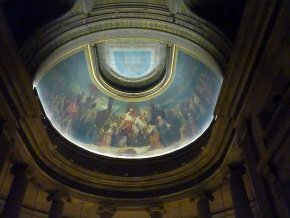 In 1852, Théodore Chasseriau received a commission to decorate the half-dome above the choir. He completed his Descent from the Cross painting of oil on plaster in 1856 (ill. 3). Between 1885 and 1887, stained-glass windows by Emile Hirsch were installed in the nave. Finally, the church was found to be too dark so openings were made in the vaulted ceiling in 1895 and more stained-glass windows provided by the Champigneulle workshop after cartoons of Albert Maignan. When entering Saint-Philippe-du-Roule on a sunny day, the situation does not look too bad even if some places inside the church clearly show significant water damage (ill. 4). However, its aspect changes drastically when it rains heavily. 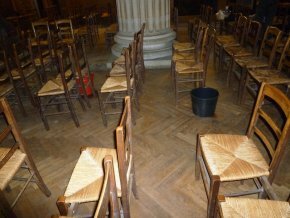 The pictures we took on 8 November 2010 show the dire conditions : the church roof is a veritable colander allowing the rain to fall in the nave so that buckets have been placed between the chairs to catch the water (ill. 5). More seriously still, some stones are starting to fall from the ceiling (ill. 6), and the left aisle had to be closed for several days (ill. 7). The rain seeps in everywhere and is also affecting Théodore Chassériau’s mural painting. Godde’s central chapel, with wall paintings by Claudius Jacquand and a beautiful glass roof, along with Baltard’s catechism chapel, seems to be the only section which is still dry. 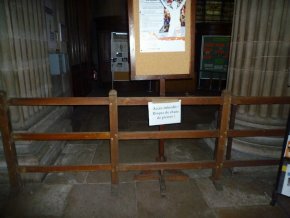 Our inquiries at Paris City Hall about its plans for the church of Saint-Philippe-du-Roule were never answered but we know that it considers the situation serious enough to have planned some repairs. However, these do not include restoring the roof it seems. The idea is to place some kind of protection over it to stop the rain from getting in, a temporary solution which might remain there for a long time. So here we have an illustration of the state of heritage in Paris : responding to an emergency when disaster is about to strike but without reflecting on the overall picture. At this rate, certain buildings, mural paintings or other art objects could well deteriorate in an irreversible manner. Conservation des Oeuvres d’art religieuses et civiles. These figures correspond to those provided to us in 2008 by Colombe Brossel, Danièle Pourtaud’s predecessor as deputy to the Mayor in charge of heritage. We asked Danièle Pourtaud for updated figures but she did not even answer our questions about Saint-Philippe-du-Roule which we sent her on two different occasions (an email on 29 November, repeated on 1st December).